Secondly a normal bulb creates rays of light which diverge as they radiate outwards. If the bulb is a couple of metres away from the disco ball then you might think that the divergence would be negligable, but no! Unless the light rays are completely parallel, you’re wasting your time. The reflections form faint fuzzy blobs on the wall, rather than impressive well focused spots. …but maybe I’m wrong about the whole parallel thing. Obviously the correct equipment for the job is a spot light. It doesn’t take a PHD in disco-lightology to tell you that. But what’s so special about a spot light? Do these have parallel rays? No they dont, because otherwise they wouldn’t be able to make big 2 metre wide spots, big enough for a ballerina to stand in. But the light is focused, so that you can put silly shaped filters on them (or dog shaped shadows with your hand). A projector is the same. A projector would be good for disco balls too. I have had some success with my disco ball. If I turn off all the lights in the house except for the light on the top floor landing. This particular lighting configuration doesn’t occur often, so it was quite an exciting discovery when I noticed the nice well focused spots on the darkened living room ceiling. Light beams were travelling 3 stories down through the narrow gap in the middle of the staircase and striking one side of my disco ball where it hangs above our sofa. The most impressive thing to try with a disco ball is direct sunlight. 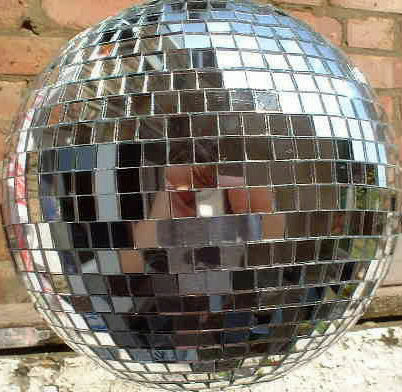 I might organise a disco party on a sunny day to make use of this. Sunlight creates perfectly focussed bright spots. Roll the ball from side to side in a patch of sunlight near the window, and it feels like the whole room is rolling!